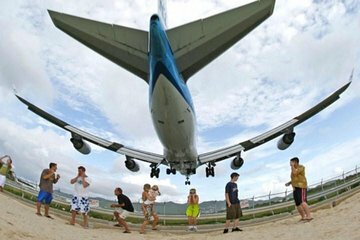 Take a break from your typical beach vacation and experience this one-of-a-kind Maho Beach tour. Sip cocktail (own expense) while viewing low-flying planes land at the nearby Princess Juliana International Airport. Listen to a live feed of communication between the arriving aircraft and the control tower or go “fence surfing.” Along with convenient departure/drop-off points and air-conditioned coach, a driver-guide makes for a more personalized tour. After having seen this. Several times on TV, we decided to check it out for ourselves. It was so much fun and the highlight of our cruise. We heard others saying the same thing! We were on a cruise but always save money by booking through Viator. We enjoyed watching the planes land while drinking a bucket of beers. Basic transportation in a clean van from the cruise port to Maho Beach. Our driver Otis was his name I think was very pleasant and accommodating allowing us an extra 30 min or so beyond scheduled pick up in order to see the big 747 come in. I think the cost is similar to a taxi and guaranteed to get you back to port in time. We were also offered the option for drop off in town for shopping, but it would've been cutting time too close for our comfort. We found out we could have got a taxi cheaper. You can take a cab there for less money.